(2012 Intimate Moments Contest) (2007 Apr/May Fic Trade) Blacksnake tries to distract Easysinger. Blacksnake glanced behind him, looking for signs of his back-trail. He hadn't been trying to remove all trace of his passage but he didn't want it to be easy to track him. He wanted his intended prey to find him but to discourage any of the usual pranksters. His mate needed the distraction of this "hunt". Things had been tense around the tribe recently. With the coming of summer, tempers began to rise with the heat. The early heat wave made it nearly impossible to sleep and even the nights were overly-warm. Coyote had been poking and prodding Whitestag more than normal lately, enough to get his neckfur up, which brought Flash into the middle to defend her lovemate. The two siblings went after each other whole-heartedly. The pranks and arguments grew more heated between them and the accompanying irritation at the results spread through the tribe like a wildfire. Then young Willow joined in on the grounds that two against Coyote just wasn�t right, so she wanted to even the odds. This brought True Edge and One-Leg into it, each defending his own cub, though One-Leg had the added annoyance of trying to separate his two cubs. And Easysinger was wearing herself down to a nub trying to soothe tempers and settle everyone down. She had asked him to plan two hunts and send the two at the center of this mess off in different directions, giving them, and the tribe, a break from the situation. But Blacksnake had done one better. He planned those hunts and sent the hunters on their way, and then he had planned this special hunt just for his Recognized. He had gathered his supplies and set out for the Far Hot-Springs after leaving a clue of his whereabouts for Easysinger. The weather had cooperated beautifully with his plans. A heavy thunderstorm the previous evening had broken the heat wave and brought the return of normal cool nights. The corner of his bearded mouth twisted upward. She wasn't far behind him judging from the sends he had received earlier. So he needed to hurry if he was going to get everything set up for her. He slid off his wolf-friend's back, hefted his pack over his shoulder, and sent Lop-Ear off to nose around in the undergrowth nearby. 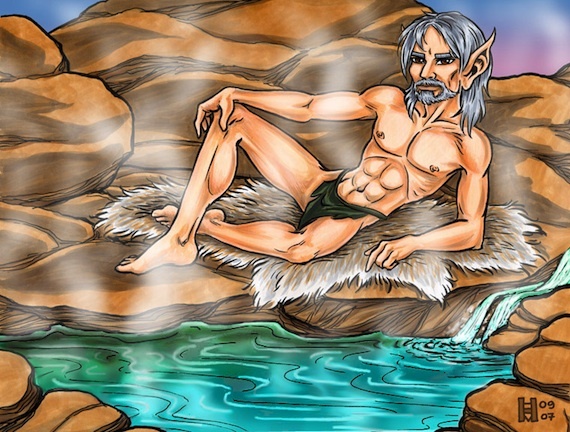 He stepped out onto the rocks surrounding the hot-springs and surveyed the area for the perfect spot. One where she would see him as soon as she cleared the trees. Finding a place to his liking, he pulled a soft brown-grey fur out of his pack and placed it just so at the edge of the water. He slid out of his leathers, leaving on only his breech-cloth, and placed them and the pack containing their evening meal out of sight. Then he settled down on the fur to wait for his beloved. ...and waited. The time seemed to crawl by. Until, finally, he heard a faint rustling coming his direction. He sat up a little and rested his arm on his knee, posed just so, watching for her arrival. His brows drew up in a little scowl when he saw Smokehowl, Easysinger's wolf, come into view riderless. Where was she? A familiar, little laugh floated to his ears. **There's my Grahn. Never complete without a glower. ** Easysinger stepped out from behind a tree nearby. She moved slowly toward him, dropping articles of clothing as she approached. Until finally she reached him in all her bare glory. She dropped down beside him on the fur, nuzzling at his neck. "This is just what I needed," she murmured. "A long soak in the hot-springs and a roll in the furs with you. Not necessarily in that order." Blacksnake wrapped his arms around her and nibbled at her ear. "I aim to meet all of your needs, beloved," he said, voice turning gravelly with desire. Blacksnake gave her a toothy wolf-grin and proceeded as she desired, his mission accomplished.